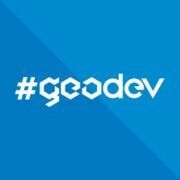 The GeoDev Meetup is a "technical social" where developers can meet and discuss all things geospatial, geolocation, spatial analysis, and GIS. Developers of all levels of expertise are welcome. It's right after work, it's free, we've got food and drinks for you, a bunch of Esri swag, and raffles too. Here is our developer website where you can learn more, download and code against our APIs for free, check out apps and code samples, and use cloud-based storage and web services to support all kinds of mapping capabilities. Also... find us on Github!